As an "ex-musician" (but forever a musician in my heart) this blog would not be complete without sharing my favourites with you. I'm so happy Barbra Streisand has finally published a new album (Love is the Answer) this year. The quality and the beauty of this record secured by Barbra itself and the producer and co-producer Diana Krall and Tommy LiPuma. If you buy this album you will find a note inside from Barbra where she's talking beautifully about her experiences of making this album. I think it's a perfect present for anyone who loves quality music.
" Love is the answer, finding someone to love is the answer"
And here is a small selection of some of my favourite artists. I love listening their music all year but especially this season and around Christmas. They always put me into that cheerful and sentimental mood which takes Christmas celebration even into a more beautiful level. If you have never experienced Renee Olstead's music I highly recommend to do. This young girl in her age of 15th has already worked with the biggest names (such as David Foster) and her music and voice is simply unbelievably gorgeous! It always captures me when somebody at this young age already has the intelligence to use her voice together with the music in a right way...that's what we call talent to born with (I guess). Who are your favourites of this season? I must say, Norah is my favorite. What did you used to play? Hey Graham, thanks for your comment and question. It was a great period of my life and a part of me still wanna sing and publishing records again. However, I had some issues with the lifestyle of being a singer...so that's the reason I quitted performing. issues was travelling a lot though I'm still travelling soooo f..g much LOL. Evi, you list my absolute favorite performers. I am not familiar with Renee, her name sound very Scandinavian though. Barbara still looks absolutely stunning. Have a wonderful week and a wonderful trip next week, I bet you are very excited. PS: Bossa Nova is my favourite music style. I play the records year around. Have you by any chance ever seen a movie entitled "Next Stop Wonderland"? Great movie filled with beautiful Bossa Nova. The first thought in my head after reading your title was how much Cute Hubby doesn't like B.S., and so I kind of "sneak" listen to her when he's not around. I'm glad she's still making music. 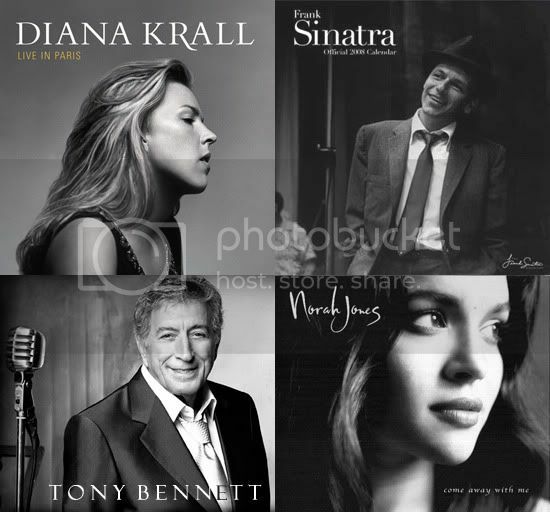 Tony Bennett is another performer that I never get tired of. Since you have a background in jazz, you probably know Anita O'Day, she was amazing. Oh, what wonderful suggestions! I will update my Christmas music today. Thank you for sharing, Miss Eve. I mainly listen to punk rock, rock, grunge and so on... so BS's music is not my cup of tea, however, I admit she's a great singer. Take care, love & Aloha. oh and I hope you don't mind.. but I'd love to add you to my blog roll.. :0) yay! What about John Mayer and Sade? 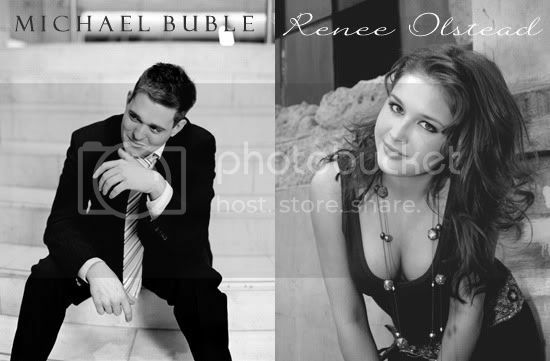 I love Michael Buble as well as Norah Jones...I also love Gavin DeGraw and love love the new Carrie Underwood CD. :) Beautiful post. This is a lovely post, Eve and thanks for sharing your favourites. Interesting to hear that you used to be a Musician and I suppose that stays with you forever. I have not heard of Renee, so will look out for her. I love having Christmas music playing when I am doing things around the house. I will FOREVER adore Barba. She is classic! I love all of these, Miss Eve! david foster is a mad genius, i worked with him earlier this year and was shocked at all the hits he is responsible for. love Barbra like buttah! Love your taste in music. I will have to check out Renee Olstead. You have some beautiful eye candy pics on your blog ! Thanks for stopping by. I have the Rat Pack Christmas CD on all-the-time in my car! I love me some Dean Martin & Frank!!! "Baby It's Cold Outside" is my favorite! Love it! I'm happy you loved my music selection! I love that you mentioned Sade...honestly, who doesn't love Sade? LOL. I selected in this post my winter favourites and Sade's music is more for the spring or summertime (for me at least).